We make building custom homes a fun experience! When you think about custom homes, what comes to mind? Do you think about a long, drawn-out process? Do you imagine a luxury home with all the bells and whistles? Do you suspect it will be a stressful time getting from vision to completion? If you said yes to these, you aren’t alone. All of these can be true when you work with some builders. However, your experience will be completely different when Chad Goodin Signature Homes is your builder. We provide custom homes in a way that sets us apart from all the rest. First of all, our homes are truly custom homes. That means your home is built on your terms. You want a luxury home, no problem. However, if you want something a bit more modest, we can certainly achieve that for you. We don’t make our customers fit a mold – after all, that pretty much is the opposite of what custom homes are all about. Second, with our many years of experience, we have been able to streamline many of the processes involved when building custom homes. Although it will never go quite as quickly as a pre-designed floor plan would, we often surprise our customers by how soon they are able to unlock the front door for the very first time. Our processes also mean the entire experience will be more enjoyable and less stressful, in part because we don’t panic when something causes an issue. We’ve handled many such situations over the years so getting things back on track is less of a challenge for us. If you are ready to learn about custom homes and get started on your dream home, give us a call. 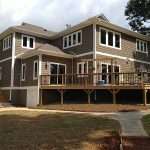 We’ll be happy to meet with you to discuss how we can make you happy you turned to us to build your new home in the Davidson, North Carolina area. At Chad Goodin Signature Homes, we can build beautiful custom homes in Davidson, Mooresville, Cornelius, Huntersville, Huntersville and the surrounding Lake Norman area of North Carolina. Carolina!